"dtv gov maps" is run by the Consumer Electronics Association and the National Association of Broadcasters.The interface hasn't changed in over a decade, but it's simple and the information is useful. "TVFool" is more complex but gives a lot more detail including gorgeous plots of theoretical signal strength and where the broadcast towers are located. 1. Connect tv antenna to "CABLE/ANT IN" on the back of any HDTV(Just power up the amplifier and hook up the antenna to the TV). 3. Scan for channels using your TV's Channel Search' and be ready to enjoy free TV. ✅Check to make sure you have correctly connected the hd antenna to your HDTV or third-party HD receiver. ✅Re-scan for channels: In the TV's setup menu, set the mode to hdtv antenna or air. Refer to the TV manual for detailed instructions. ✅Reposition the indoor hd antenna in a different location. It is suggested place it higher on a wall or closer to a window. Sometimes moving a few feet can make a difference. ✅keep the hdtv antenna away from those big power consumption devices interference, such as air conditioner, refrigerator, and microwave oven, etc. 【FREE HD CHANNELS】With NEWEST 2018 TV Antenna, no need to pay HUGE BILL on watching TV now. Our HD antenna is the best on the market and can receive full HD Channels like ABC, CBS, NBC, PBC, Fox and SO MANY MORE. 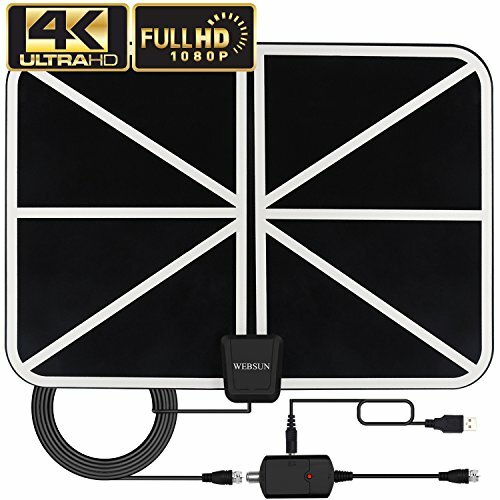 With amplified tv antenna, start to access all of the news, sitcoms, kids and sports programs! Easy and free tool to receive channels without monthly bill for life! 【CRYSTAL-CLEAR PICTURE & HD SOUND QUALITY】Our smart tv antenna adopt upgraded powerful 2018 Amplifier Signal Booster with built-in Smart IC Chip Next generation & Crystal Clear Filter Technology to picks up signals. The new technology filters out cellular and FM signals to guarantee clearer picture, low noise and access to more free broadcast TV signals. 【OMNI-DIRECTION RECEPTION UP TO 80 MILES RANGE】The indoor HDTV antenna can reach up to 80 miles and be placed almost anywhere in your home. Digital antenna constantly scans for new channels as they're made available for broadcase. Hang the indoor antenns on a window or wall, or better position where owns better reception of your house. Please try with or without the amplifier for the best solution. 【18FT LONG COAXIAL CABLE】 18ft antenna's cord is long enough for you to make amplified antenna easier to place in your house and get the best reception, especially for customers whose televisions are quite far away from windows. 【SATISFACTION GUARANTEED】Professionals of our team is constantly working to make you happier. We provide technical support for customers 24/7. We are confident in the quality of our product and give you LIFETIME WARRANTY and great customer support. Click "BUY IT NOW" and ENJOY QUALITY OF OUR NEW TV ANTENNA. If you have any questions about this product by WEBSUN, contact us by completing and submitting the form below. If you are looking for a specif part number, please include it with your message.